Today has to be the day! It's already November, and these lunches were enjoyed by Nikolai during Spring time! I guess its has to be that time really does fly when you are having fun! I found this post which was written and overlooked it in my draft folder. It's almost almost summer time and it's also time that we switch up our yard decorations. We have several flamingo decorations and they look super cute when pink in color for the first few months, but due to the hot Florida sun, they start to fade after that. The pink almost looks like white now and I can't wait to remove them even though they still look cute. 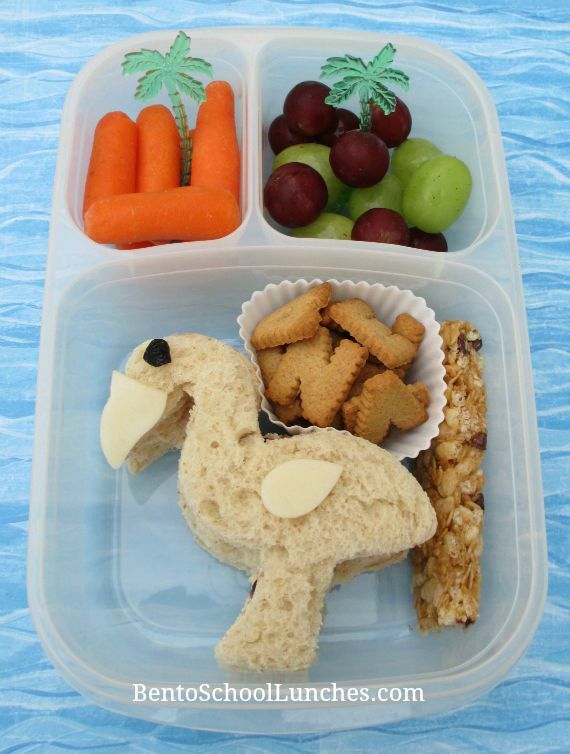 This bento lunch features a flamingo which looks quite like the one in our yard, not pink at all, lol! I used my flamingo cookie cutter from my Wilton cookie cutter set for the sandwich, accents are provolone cheese and a raisin for eye. Alongside he had Ikea alphabet cookies in a silicone cup, organic granola bar, organic baby carrots, seedless red and green grapes with palm tree cupcake picks. This lunch was packed in an Easylunchboxes container. 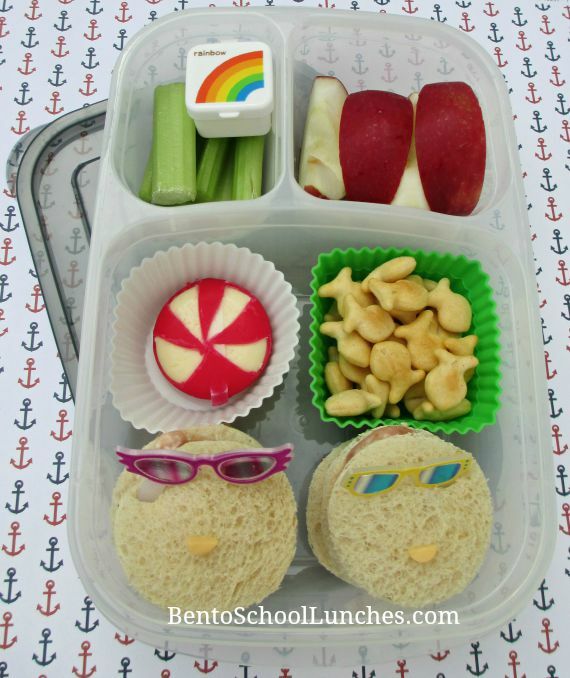 We live not too far from the beautiful beaches and the second bento has a beach theme. The sandwiches, which were shaped with a circle cutter are decorated with provolone smiles and sunglasses picks. In silicone cups there are a babybel cheese with the covering cut to resemble a peppermint and some fish shaped crackers. Top left I included some celery sticks and dressing in a mini container and top right I included some apple slices. This lunch was packed in an Easylunchboxes container. Both are so fun and cute! Love the carving on the babybel! Love them both. Yes, time flies, seems like just yesterday when the year started, now we are almost at the end.